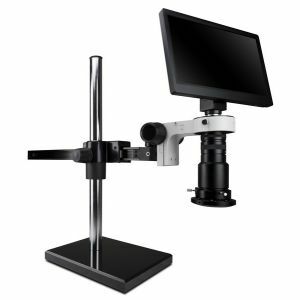 Scienscope MAC3-PK5-R3 Macro Video Inspection System: macro video zoom optics (up to 40x magnification with 8" working distance) on gliding arm boom stand, 1080p HD camera and 12" LCD monitor combination with NEW high intensity LED ring light with polarizer (IL-LED-R3). All Sciencope MAC3-PK5-RS Macro Video Inspection system includes camera monitor combo with 8GB SD card, wireless mouse, USB cable, power supply, and image capture software. The new Scienscope MAC3 Ergonomic Digital Inspection system is the next step in the evolution of our powerful line of digital/video inspection systems. The revolutionary MAC3 series from Scienscope merges the latest in HD video technology with the clearest macro video optics to provide an easy to use ergonomic inspection system for your most fatiguing and difficult to see quality processes..
Purchase a Scienscipe MAC3-PK5-R3 Macro Video Inspection System Today!